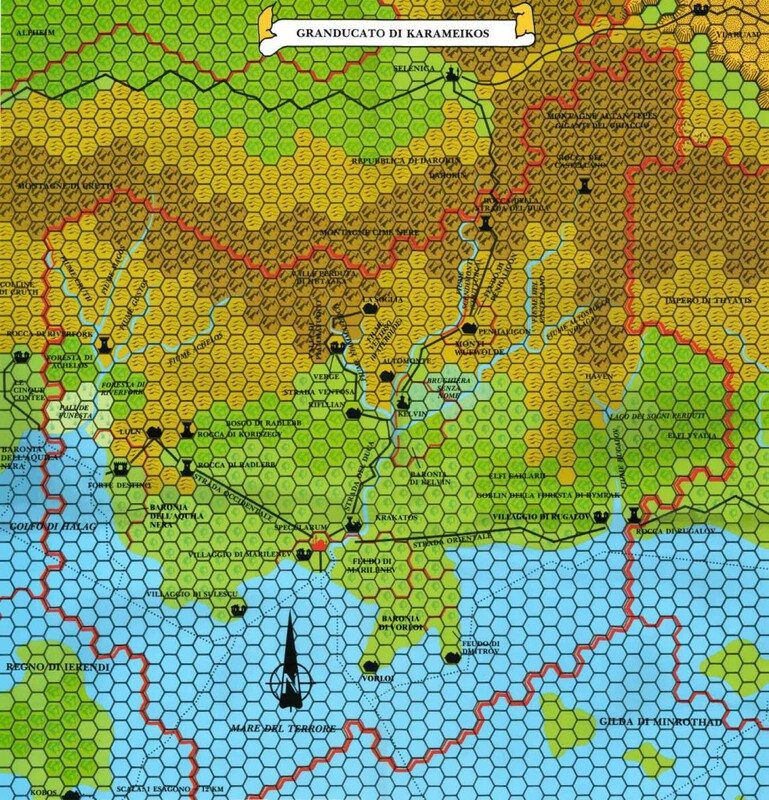 The first time I ever played a real role-playing game was a few months after I had bought Baldur’s Gate in a little computer store, in Brescia. I had been reading the game’s manual over and over again and I was thrilled with the idea of being able to play my very own character, with a background story I made up. Back then, my History and Philosophy teacher offered me and some friends of mine to try the first edition of Dungeons & Dragons, from which came the Advanced Rule Baldur’s Gate was based on. He photocopied for me and a few others the whole content of the famous Red Box, so that we could read it and understand the rules, to explain them to those who weren’t as excited as I was. He was going to be the Master of our large group (there were 7 of us, I later figured out there were too many of us to actually play a good game) and so we found ourselves in the southern Grand Duchy of Karameikos, in the Black Eagle Barony, to be precise. The plan was to march north and make a fortune as mercenaries, but the reality turned out to be much worse: after arguing about which route to take, the group was attacked by a flight of harpies, drawn to us by our loud voices, and without any real fight they slaughtered my comrades. My young mage, who had fainted at the very start of the combat, survived only because he was buried under the corpses of his companions, but I don’t think he ever even made it to the nearest village alive. Scared by that onslaught, almost all of my friends left and we never had the chance to put an end to that story. On the same year, in Italy, 25 Edition published the third edition of Dungeons & Dragons, which would have, for better or for worse, marked my life. It was the biggest revision of the original rules of D&D since 1974 and it simplified a lot of the most absurd rules of the previous editions, like Thac0 and Armor Class. Its take on character creation changed a lot, too: as D&D and AD&D (which stands for Advanced Dungeons & Dragons) allowed to create really iconic, but also very stereotypical and similar to one another characters, D&D3rd allowed an unprecedented customization, thanks to hundreds new feats and skills you could choose for your characters. Alas, our teacher was very fond of the first edition, so we young newbies had to do it on our own and we started creating our own adventures, taking turns as Dungeon Masters. Here’s the first point leading me to talk about Dungeon World and how different the two systems are. In D&D, regardless of the edition, the DM isn’t just someone who plays all the non-playing characters his friends are going to meet, he is primarily the storyteller: he’s the one preparing the campaign and driving in a more or less visible way the story the characters are living, through what he believes are the most important events in the story as he imagined it should go. 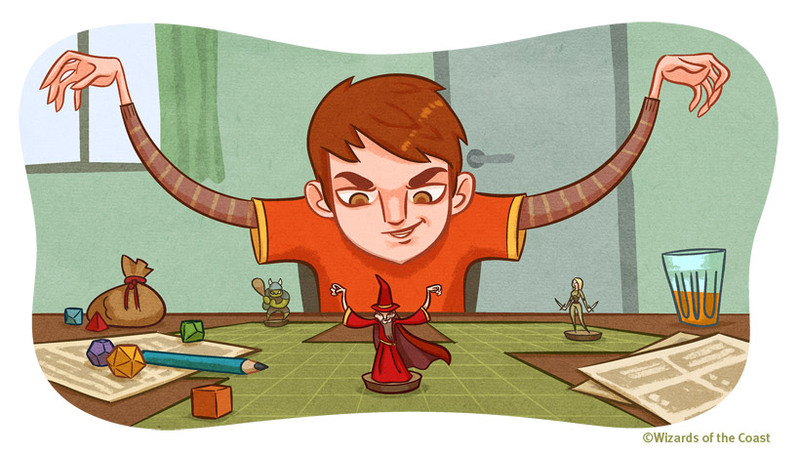 To be clearer, the typical DM of Dungeons & Dragons is like all those Dragon Age 2 levels: linear, allowing you to explore only those tunnels he considers relevant and showing you doors you’ll never be able to open to see what’s behind, driving the PCs (Playing Characters) towards the final boss, with which he’ll try in some more or lesse subtle way to kill the characters. Our first adventures were full of epic moments and sudden deaths, at least until we became expert enough to enter the dark territories of Power Playing, something that gets D&D closer to its origins, that is strategic miniature combat games like Warhammer. Once you learn the basics of Power Playing, role playing stops being an adult version of “Play pretend” and becomes a mathematical challenge against statistics and against your DM, to see which character will deal most damages in combat. It also becomes the moment when your PCs become virtually immortal and the idea of fighting a dragon isn’t scary anymore and the only thought of a Power Player is “More experience points!”. I admit even I gave in to this dark power, which in turn made it hard for me to appreciate fights, probably the most important part of any classic D&D campaign. The idea of spending 6 hours a week just waiting for my turn to throw a couple of dice to see how many creatures I’m going to kill is too dull. With Power Playing came along the end of high school and my classmates and I took different paths, finding new playing groups. Since then I’ve been trying anything I could: AD&D, Cyberpunk, Lord of the Rings, D&D Next, Warhammer, The Call of Cthulhu, until a couple of months ago, during an episode of Fumble we met a guest who gifted us with the Dungeon World manual, an indie system based on Apocalypse World and written by Sage LaTorra e Adam Koebel. 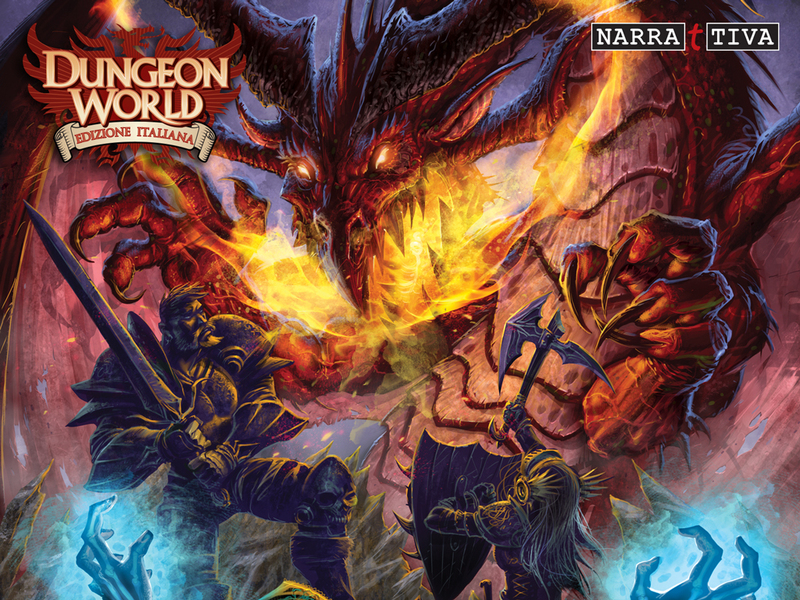 Produced thanks to a successful campaign on Kickstarter, Dungeon World moves the focus away from the three biggest problems I have with D&D: too complex rules, too stiff Masters, and dull and repetitive combats. The idea is to bring back the story as the heart of roleplaying, leaving to fights the same amount of time you should spend parleying with orcs for a safe passage through their lands, while letting the players build their world together with the Game Master, using every single idea the players are willing to put on the table to make the story grow. Furthermore, unlike every other role-playing game, the Master has little to nothing to prepare prior the gaming session and is encouraged to leave blank spaces in maps and settings, so that the other players could contribute to build a world that fits them the best. This doesn’t mean the Master has no work to do, he still has to write dangerous Fronts, urging the characters to take actions. Here’s the whole point: just like what the Oracle does to Neo, Dungeon World’s Game Masters can only show their players the threshold, but it’s up to their characters to decide if and how they want to cross it, knowing that either course of action will have repercussions. 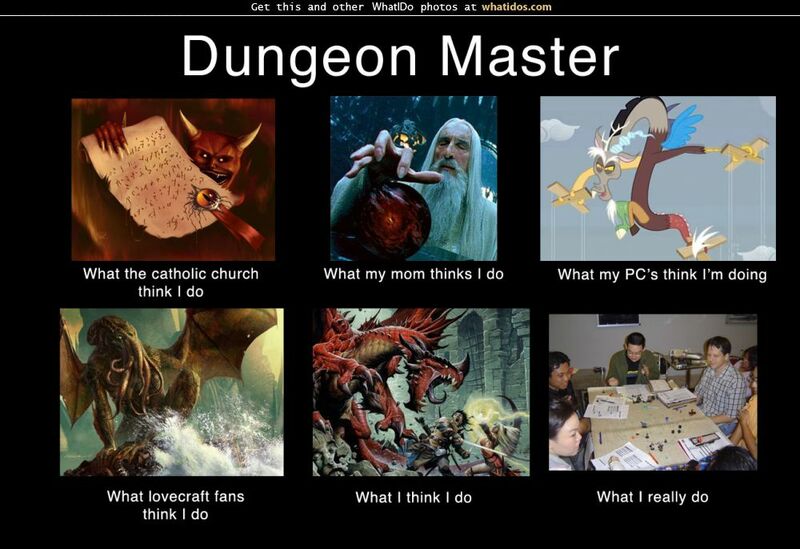 That’s why a Dungeon World Game Master is similar to the first Dragon Age, where one could face the story in different ways and if the designers put a door in a dungeon you could just open it, whether there was something useful on the other side or not. The ending too could have been different, according to the choices you made through the game. And now I’m going to say something that will make all the D&D aficionados go awry: Masters in DW can’t cheat at all! Simply because there is no need to and during battles too, heart of many D&D campaigns, the GM doesn’t throw a single die: if players lose hit points it’s because their throw of dice went badly, not because a vengeful DM decided to destroy the paladin’s sword, just for the sake of it. As a master myself I liked this idea a lot and, despite my love for settings and detailed maps I make, I love to give my players the power to shape the world however they like. I had to wait for that famous episode to understand how much DW was actually the system I had waited so long: the moves the characters can make are very simple and leave large scope for interpretation (thing that will make the D&D supporters turn their nose up), as long, and the authors repeat it many times in the manual as the player’s action makes sense for the whole group and above all makes sense for the story. Actions taken without motive, like a mage who casts Ray Frost every minute strolling in the forest just because he can cast it as many times a day as he wants, in DW have no sense at all. As it doesn’t make sense to orderly wait for the monster to attack your defenseless companion while you’re standing right next to him doing nothing just because it’s not your turn yet. The question I got asked the most by those used to play D&D when, like some kind of Jehovah’s Witness, I asked them if they had 5 minutes to talk about Dungeon World was “Alright, but why should I change a system that always worked for me?”. The question comes up every time, especially from ex-players or people that never went farther than Advanced Dungeons & Dragons because they feel “afterwards became a mere question of numbers”. And the answer is exactly: because Dungeon World isn’t about numbers, it’s about a group of people telling a story. 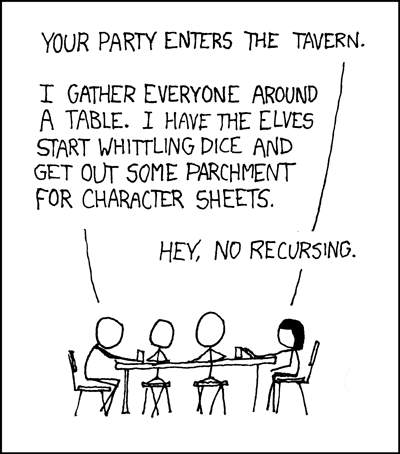 I can anyway imagine most of RPG players are indeed nerds and as such are more at ease with numbers and tactical positioning of tokens on the game board rather than theatre and improv. And there are the lazy ones, who know exactly how many damages Disintegration deals even if you save and don’t want to get out of their comfort zone. In the end I can’t tell you which system is the best one. If you think about it it’s kind of like watching “Rocco and His Brothers” or “Army of darkness”, where D&D is the classic of italian neo-realism and DW is the best classic action movie. Both have great merits and both have their flaws. There are people who love to plan every single tactical detail of a combat and people who just want to do some legolas-style action without having to spend two hours throwing dice. I love both systems and I still play both D&D and DW and I know neither of them is better than the other one in terms of absolutes, but I hope every RPG player will at least consider trying a story-driven rather than rules-driven system, as I think every DM should at least read the Dungeon World manual, which you can even found online for free, to understand how important the players are to the story their group is living. In his 30s hasn’t stopped playing, both on the radio and at home, with dice and joypad. Talks about videogames, tells fantasy stories and spends the rest of his time on Tumblr or Reddit. He’s been living in Milan for 10 years and wouldn’t go back for anything.